For the Japanese dub of the film, Wonder Woman is voiced by Kotono Mitsuishi, best known as the voice of Sailor Moon. Like Wonder Woman, Sailor Moon is a princess heroine of divine heritage and based on Greco-Roman mythology. The source of this information is the IMDB trivia page for the Wonder Woman film. I’m pretty sure this isn’t true! 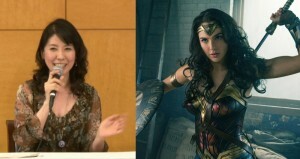 Kotono Mitsuishi did the voice over narration for the Japanese Wonder Woman trailer, which many news sources including this site reported on back in March. It seems likely that this information was mistakenly used as evidence that Kotono Mitsuishi, the voice of Usagi in Sailor Moon and Sailor Moon Crystal, would actually voice Wonder Woman in the Japanese language dubbed version of the film. The narration in the trailer is not the actual voice of Wonder Woman who’s English voice can be heard in the trailer. I can find no indication by doing searches of various sites in English and Japanese that Kotono Mitsuishi will be the voice of Wonder Woman. It seems quite unlikely that Kotono Mitsuishi would voice this role as she was not the one to do the Japanese dubbed voice for Wonder Woman in Batman V Superman. We can see from the Japanese Wikipedia page for Batman V Superman that this was actually done by voice actress Yūko Kaida who may be known to readers for some of her anime roles. It seems likely that she will be the one to voice the character for the Wonder Woman film. Actors will often dub the voices of the same actors in multiple films especially when there are part of a series where the actors appears in more than one film. While it is certainly possible that independent of her doing the narration for the trailer Kotono Mitsuishi will also be included with the Japanese dubbed version of the film which isn’t set to be released until the 25th of August we don’t actually have any good evidence beyond this bit of IMDB trivia which indicates that this might be the case. Keep reading for more exploration of the specific research which led me to this conclusion.